Scratch-coated anti-counterfeit labels can be scratched to make the coating too thin, and do not need to be scraped. The goods are found on the hands and are now almost gone, which seriously affects consumer identification and makes the fake molecules organic. Can scrape off the coating too much, can not be completely hanged, the need to use extra force to scratch for a long time to see the inside of the handwriting, so strenuous, affecting the consumer's user experience.Scratch-coated anti-counterfeit label of the coating to scratch the underlying layer of the coating, and the handwriting is not clear after scratching. This is a factor that the quality of the material used is unqualified. Many non-standard anti-counterfeiting companies use cheap disability for the benefit. Secondary information. 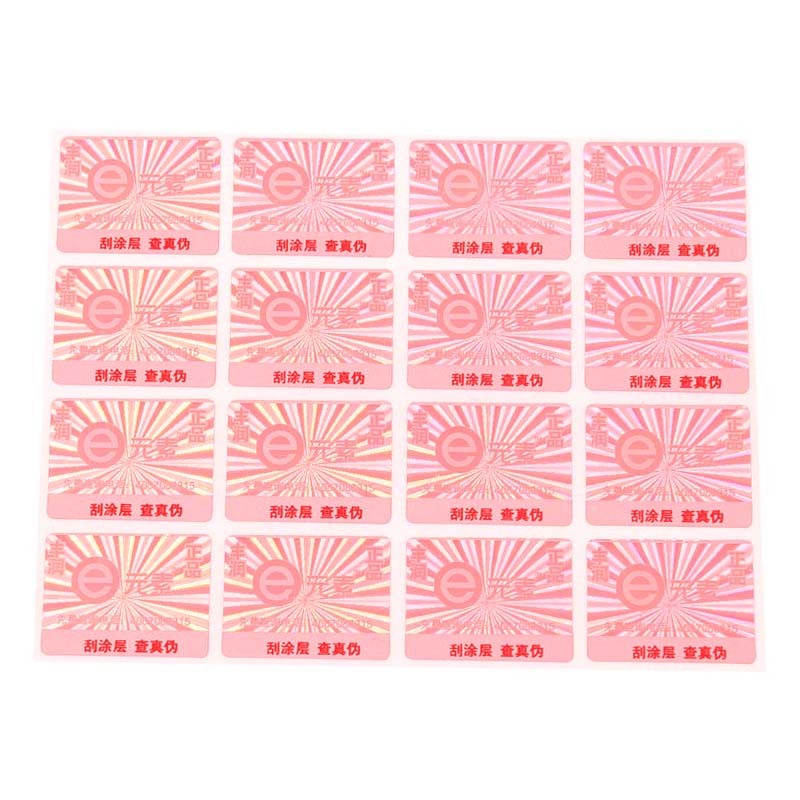 Seriously affect the company's credibility and brand influence.Color scratch-off coating anti-counterfeit label is diversified and can be customized according to customer needs.Laser anti-counterfeit stickers are also called laser anti-counterfeit labels. The appearance of such labels is also very beautiful. The colors and textures seen at different viewpoints are also different. This kind of label is also used by many product companies, and it works well.The most commonly used materials for Scratch-type digital Security Label are self-adhesive paper, fragile paper, plastic film data, PVC, coated paper, and so on. The most commonly used information for scratch-off digital anti-counterfeiting labels is self-adhesive paper. The data cost is relatively high. It is widely used in the cold regions of the north, and is also used in some places where high viscosity is required. The biggest feature is that the label can't be transferred. The label also has the characteristic that it can complete the double effect, that is, the label can be uncovered like the uncoverable digital security label, and can also be scraped. In addition, our company also produces other types of stickers. Such as: Water Discoloration Label, Thermometer Label, Temperature Label, Paper Label, Self-adhesive label and so on. Choose any as you like! Anti-counterfeit stickers are the essential product attributes of a product that is affixed to the product and used for product anti-counterfeiting and brand awareness expansion. After the general enterprise has demand, it will find anti-counterfeiting printing manufacturers to make it. You can find me. Looking for ideal Scratch-coated Anti-counterfeit Label Manufacturer & supplier ? We have a wide selection at great prices to help you get creative. All the Laser Anti-counterfeit Stickers are quality guaranteed. We are China Origin Factory of Scratch-type Digital Security Label. If you have any question, please feel free to contact us.